Our Stocking Stuffer of the Day for the bicyclist in your life you has everything is our custom keychain! It's got our logo and "Define your life. 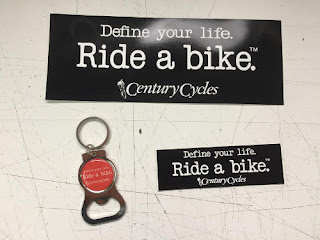 Ride a bike.™" motto in white type on red background, plus it doubles as a bottle opener! Only $2.99 each! Of course, our bumper stickers (both large and small available) are FREE as always! If you plan to visit for your last-minute shopping, remember that all three Century Cycles stores are open 10am-5pm on Friday, December 23, and 10am-3pm on Saturday, December 24! There's still time to find the best prices of the season at our "Oh What Fun It Is To Ride" Holiday Sale!